Is Ruthmere Mansion in Elkhart, Indiana haunted? 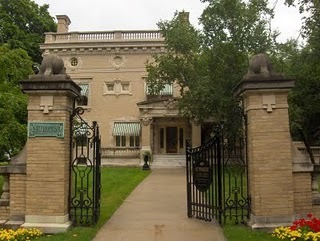 The Ruthmere mansion was built in 1910 and was originally the Albert and Elizabeth Beardsley Residence. The property was placed on the National Register of Historic Places in 1978 and is now open to the public as a museum. The number of ghosts at the mansion is unknown, but it has been estimated that there are more than 10 spirits that reside here. Who they are however, seems to forever remain a mystery. There are various stories of a murder that took place in the house, but how accurate these stories are seems hard to uncover. As for reports of hauntings, the most common experience is to witness poltergeist activity. Objects being thrown and moved around in empty areas. The mansion is said to experience activity all year round, but especially on Halloween, the reason however, is unknown. Other reports include electrical equipment randomly turning on and off, such as alarms and lights, and there are even some stories about people hearing gun shots coming from the house when it is vacant.